A Westford Girl Braves the Cold to Raise Money for Homeless Teens | One to Watch | Kids VT - small people, big ideas! Celia Andrews admits that she doesn't like being the center of attention. But the sporty, low-key seventh grader has been getting a lot of it since she came up with the idea to start a kids' fundraiser as a complement to Spectrum Youth & Family Services' annual Sleep Out. Celia hatched the plan in 2012 when her mom's friend came over to borrow a sleeping bag for the Sleep Out — a March fundraiser in which business and community leaders spend the night outside to raise money for the nonprofit organization and show solidarity with teens and young adults who are homeless. Sleeping outside sounded like fun to Celia, who's an avid backpacker in the summer months. So the next year, then-9-year-old Celia and her mom, Julia, asked if they could join in. Spectrum staff told them it was an adult-only event and suggested that the pair make cookies and deliver them to Sleep Out participants. But Celia wanted to camp. So, with the help of her mom, she set up a crowdfunding site, secured $1,200 in donations for Spectrum from family members and friends, and spent a night in a tent with her mom in their Westford backyard. Along with the novelty of sleeping out in the cold came more serious conversations between mother and daughter about the true meaning of the fundraiser. "Yes, it's fun to sleep outside," Julia remembers saying to Celia, "but it's not fun if you can't go inside." Celia took that to heart. "You do start to think about what would it be like if you didn't have a bunch of blankets," she said. Spectrum executive director Mark Redmond's son, Liam, heard about what Celia was doing and was also inspired to sleep outside in 2013. The next year, Spectrum's development office created an official Student Sleep Out. 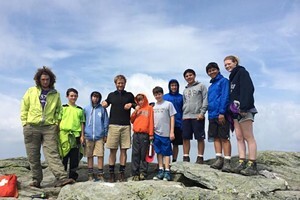 The nonprofit invites kids across the state to camp outside with school and church groups, sports teams or friends to raise money for Spectrum. For Celia's second Sleep Out, Julia publicized the event on Westford's Front Porch Forum, and Celia and many of her friends camped on the small-town common, where community members brought them hot chocolate and cookies. The weather didn't cooperate, though — there was a foot of snow with water underneath, and it poured all night, Julia remembers, joking that it was "total misery." Still, Celia's group raised more than $3,000. Another 120 students at 14 locations in Vermont raised a total of $26,653. Last March, 380 Vermont kids and teens participated in the Student Sleep Out and raised more than $45,000. 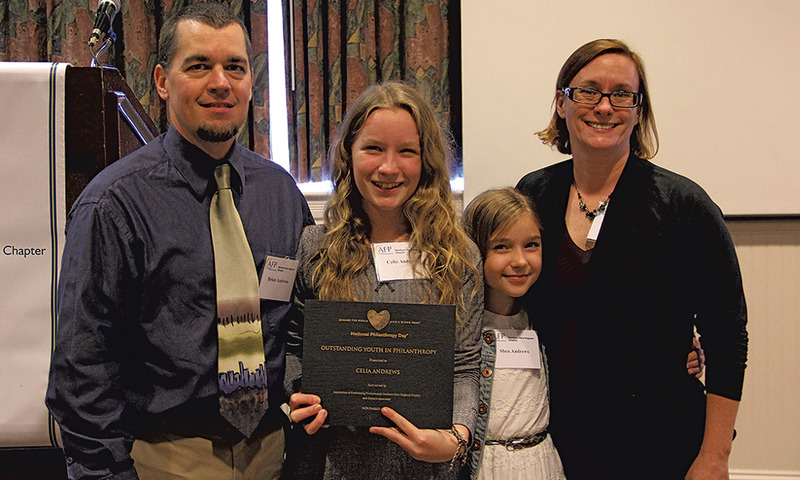 In November 2015, Celia received the Outstanding Youth in Philanthropy Award at the Association of Fundraising Professionals Conference in Stowe, an honor that came with a $5,000 educational scholarship. Organizers introduced Celia's award with a video featuring her family, her principal, her soccer coach and even Gov Peter Shumlin singing her praises. "It's pretty cool to get an award for this," Celia said, noting that "it was a little nerve-racking." At the end of this month, Celia will take part in her fourth Sleep Out. She hasn't firmed up plans yet but says she'll probably camp in her backyard. Her 10-year-old sister, Shea, will join her, and Julia plans to invite Celia's Far Post soccer teammates as well. They'll have a campfire, make s'mores and snuggle in with lots of blankets. Thanks to Celia, hundreds of kids in backyards around the state will do the same.